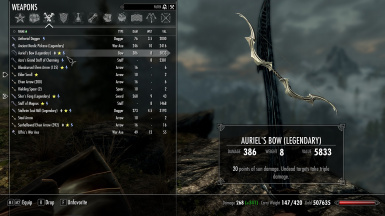 This mod makes some improvements to Auriel's Bow that I've been using for a while on my character, but I figured I'd share them with everybody. 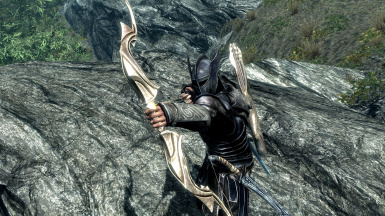 I've increased its base damage to 20, 1 higher than a daedric bow to better reflect its status as a legendary aedric artifact. Previously it just had the damage of a normal elven bow. I've also doubled the damage of the enchantment from 10(30) to 20(60) and removed the enchantment charge capacity entirely; you will always get bonus sun damage and never have to worry about recharging it with soul gems. 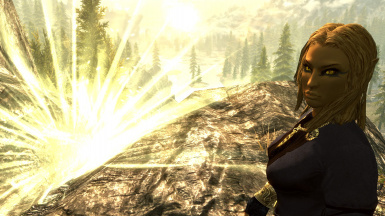 The biggest change is to the sunstorm that gets triggered when you shoot the sun with a sunhallowed arrow. Originally it only lasted 15 seconds, but in my mod it will last for a full minute. 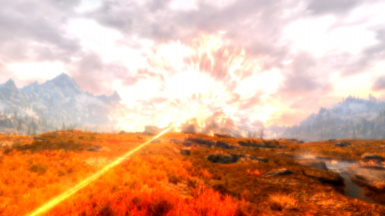 I've also significantly increased the damage the sunbeams do: each beam deals 88 damage to normal enemies and 120 to undead ones. I've balanced this for high-level play on legendary difficulty where damage dealt is divided by 4 so it may be a tad overpowered on lower difficulties. Considering you have to be fairly far into the main quest to even unlock the weapon at all I think it's appropriate to be catered towards high levels. The final change improves the friendly fire immunity of the sunstorm. While Bethesda actually did try to implement it so friendly targets won't be aggroed by the beams originally, I've found that in my game people would still aggro anyway somehow and I'd randomly end up with a bounty and guards attacking me. With the changes I've made, you can be certain that the sunstorm will never damage or aggro anyone who wasn't already going to attack you anyways. Try using it in towns, it's fun! Don't worry though, if you've already got a bounty or just want to kill a ton of guards for whatever reason, the beams will start to work on them if they're attacking or searching for you. I've also made non-hostile animals immune to it, so you don't have to feel guilty about seeing a bunch of poor deer and bunny lifebars constantly draining down to 0 on your screen whenever you use it in the wild. It will still work on predatory animals that attack you, although if you use the Kyne's Peace shout any animal affected by it will temporarily become immune. 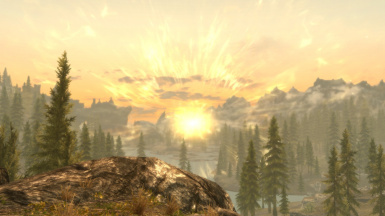 Obviously you need to have Dawnguard DLC for this mod to work. Also remember you need to be using the special sunhallowed arrows to trigger the sunstorm. You can get them from our friend at the Temple of Auri-El in the Forgotten Vale. 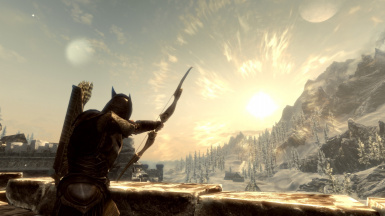 I haven't changed anything about the way the Eclipse with bloodcursed arrows works in this mod, as there really isn't much to alter. Let me know if you have any ideas. Thanks and enjoy!